Electro acupuncture is performed by attaching an electrical probe on the needles of two different acupuncture points which produces a mild and painless electrical current between those points, thus reducing pain and muscle spasm. Acutron: I use a special therapeutic device called the Acutron which incorporates microcurrent, color and light. It is a highly versatile electro-medical device offering a wide range of valuable treatment modalities. By using the frequencies from microcurrent, color and light, balanced healing of the body is accomplished. It is highly effective with decreasing/eliminating pain, digestive complaints, respiratory concerns, depression and anxiety (including PTSD), and much more. 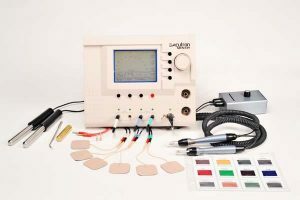 MicroCurrent Stimulation: This is an FDA approved device that can be used to stimulate the acupuncture points around the eyes to increase qi and blood circulation along with the microacupuncture and acunova eye treatments. This device is used when appropriate.